A while ago our amazing sysadmins upgraded our bugzilla installation from something aging to something more modern. Hurrah! We are not a billion years behind in another software! Hurrah! Unfortunately this meant we lost some of our ¿custom? code that allowed to show the Votes column in searches like this (click on the change columns link at the end). One can still see the votes in a particular bug, but for things like wishes it was very useful to be able of sorting by votes. 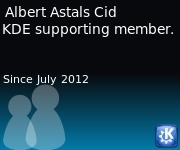 If you want to help do not hesitate to contact me on aacid@kde.org and I'll forward you to the appropriate people, or even better just join the #kde-sysadmin channel in irc.freenode.net and present yourself as volunteer to do this job. This disconnect comes from the fact that bugzilla is not tied to your identity.kde.org user. If you want to help (and you know you want) do not hesitate to contact me on aacid@kde.org and I'll forward you to the appropriate people or even better just join the #kde-sysadmin channel in irc.freenode.net and present yourself as volunteer to do this job. A few months ago a professor from the math department of FU Berlin filed a few bugs to poppler and Okular about video playing not being totally implemented/bug free. After a few mail exchanges it became clear that given the always scarce resources in free software projects his bugs would not be fixed/implemented in a timely way since the poppler/Okular priorities and his' did not align. One of the often overlooked features of Free Software is the non existent vendor lock-in, in the non-free software world, if the company creating the software you use thinks your feature is nice to have but not important enough to develop, you are out of luck, it'll never happen, in the Free Software world you can have someone else develop it for you and get it merged upstream relatively easily.